Nine years ago this past weekend, we moved into our home. but never doing a thing I tell you? they are foundation words, words to build a life on. who dug deep and laid the foundation of his house on bedrock. nothing could shake it; it was built to last. you are like a dumb carpenter who built a house but skipped the foundation. When the swollen river came crashing in, it collapsed like a house of cards. It was a total loss." not a house to live in with our family, but a soul house. When we begin to build it, it needs a foundation. And the only foundation that will keep us safe is the Rock-Christ Jesus. We build on this Rock by obeying Jesus' teaching. in the Bible, to know what His teachings are. The Bible is a blueprint that will tell us exactly how to build our soul house. and beat against our soul house, we will not be shaken. who built her house, but forgot to dig deeply for a foundation. to collapse like a house of cards. To be declared a total loss. I want to be the wise carpenter. Secondly - wow - that is a gorgeous house you live in! BTW. what is a subdivision? Is the house all yours? Beautiful house and post! Yes, so true! love your post...and in love with your home...it must be sooooo great to have a basement!!! So very true and an inspiring post! Thanks. We also find it fun to look back on the building photos of our home and also to reflect on 'where' we are now. Leslie, what a wonderful post. Great way to spread the word through your blog. I love your home. Ours took six months to build, too. Thanks so much for your comment on my T post. You made me laugh. Thanks. Wow, what a beautiful house and, with the Lord as your foundation, what a beautiful home. Thanks for explainging the subdivision to me. I never realised that would affect you hanging laundry out. I thought your backyard would be private? Oh, and yes, I am still up for the swap in a few weeks. I shall try to find a few tasteful Scottish things, but I think we should stick within a budget don't you? Do you mind a couple of homemade bits and bobs too? I love this post. You are SO right that it's not "if" those raging waters come but "when". I want to be built firmly on the rock when they do. BTW... Love your home too. You and I have very similar tastes. Surprise, surprise! 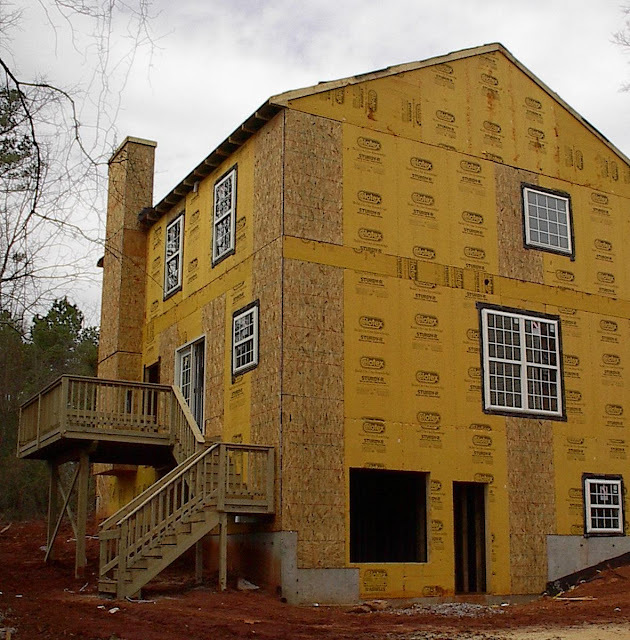 What a great post and what neat pictures of your house as it is being built -- great memories! Wonderful insight. And I enjoyed the pictures of your house being built. What an AMAZING post!!! Very powerful! Summer is such a good time to spent extra time in the WORD! This summer we are focusing on our marriage and parenting. I want it all to be centered around HIM which means I gotta get off the throne in a few areas of my life! Great post, Leslie! Thanks for the reminder that the only foundation that will stand the test is the Lord Jesus. Thank you for another inspirational post. 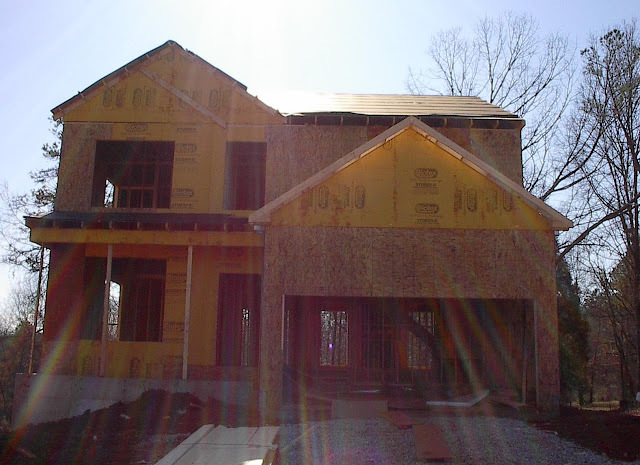 I love how you tied the carpenter tale into the photographs of the construction of your home. Those words dug deep into my heart. Thank you for giving me inspiration today.